High use lottery applications will be accepted November 1, 2011, to February 1, 2012. All applicants will be notified of results by the end of February 2012. Low use, low water, one-day trips, and any available high use trips are available for reservation beginning March 1, 2012. Mail application to: River Office, Dinosaur National Monument, 4545 Highway 40, Dinosaur, Colorado 81610. Only ONE APPLICATION PER PERSON is accepted. Duplicate applications are destroyed. Use only current 2012 application. Applicants must be at least 18 years old. Applicant or trip leader must have operated non-motorized boats on rivers rated Class III or higher. Illegible or incomplete applications will be rejected. Please type or print information clearly. immediately upon booking a trip by non-lottery participants. The permit fee for a multi-day trip is $185. If the fee was not paid at the time of booking, the permit fee is due no later than one month prior to the launch date or the trip will be cancelled. If the trip is picked up through the cancellation process and is less than 30 days away, the $185 permit fee must be paid at the time of booking--no exceptions. When is the best time to pick up a launch date through the call-in system? We have about a 30% cancellation rate due to either non-payment of fees, or private trip leader cancellations. The river office cancels trips for non-payment 28 to 30 days from the launch date, depending on how the calendar falls. Trips canceled by permit holders can occur at any time. Contact (970) 374-2468 M-F between 8:00 a.m. and 12:00 noon (Mountain Standard Time). Take out here or continue down through whirlpool and split mountain sections on the Green. 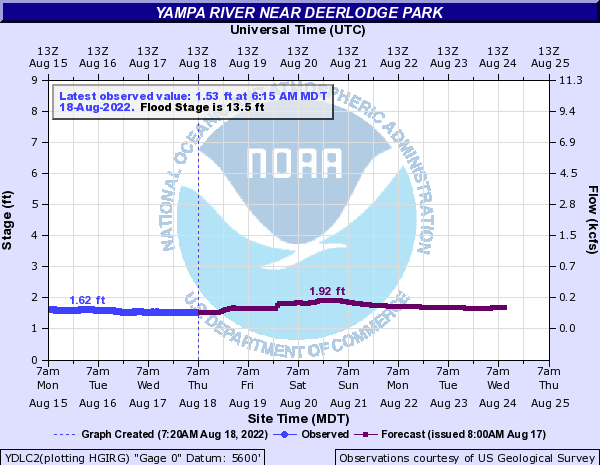 This is the most talked about rapid in the main Yampa Canyon. The river narrows as it drops over the rock debri that was deposited by the warm spring flash flood in the 60's. More rock fall occurred after 2010 slightly altering the entrance into the rapid. Run this rapid by staying right as you enter the rapid. Pull/Push hard through some lateral waves coming off of the right bank to end up in the slower moving less turbulent water on river right. You'll pass Godzilla hole here. Once you are past that you can pull left hard to miss another hole at the bottom of the slower water just above maytag hole. Doing this will have you pass left of maytag. You can also just blast through the smaller hole above maytag and skirt maytag on the right. If you miss the entrance and setup on warm springs you are gauranteed a white knuckle beating in Godzilla and probably Maytag holes. Scout from the medium sized eddy on river right immediately above the rapid. Scout trail is rocky with lots of boulder hopping. on river right. room for several camps or parties here.